Chia is a staple seed that’s used as food in many communities around the world. Some people also consider it a form of medicine. This product has a rich history dating back to the Mayan and Aztec civilizations. Scholars claim the latter valued it even more than gold itself. Chia is a very nutritious food with a 2 tablespoon serving containing around 4 grams of protein, 7.4 grams of fat and 8.3 grams of fiber. If you’re wondering where to buy chia seeds, we’ve compiled a list of a few places to get them. Make sure to also check out our article on 7 amazing health benefits from Chia seeds. There’s a rising number of health food stores in the United States that are stocking chemical-free and organic chia seeds. For the best quality of products, always look for organic seeds which are produced by reliable companies, mainly from states with high food safety as well as quality standards. Most of the seeds supplied to local health food stores are grown in natural environments, using sustainable farming techniques that are great for you and the surrounding environment. We are big fans of Sprouts Farmers Market and The Vitamin Shoppe. Additionally, these seeds have been tested and approved by 3rd party laboratories which ensure that each batch is clean, pure and free from chemicals, also that each bag meets the highest possible nutritional standards. For instance, a 15-gram portion of Chia Co seeds has around 5.6 grams of dietary fiber, 3.1 grams of protein and 2.9 grams of omega-3 fats. Buying chia seeds in bulk is recommended for those who want to save money when purchasing but be wary about buying way more than you need. Sometimes the seeds can lose a high amount of their nutritional quotient if stored for long periods. Therefore, if you want to buy this product from wholesalers, just be sure you will use it up before the expiration date. Even so, if you still want to save cash by ordering greater quantities of chia seeds but don’t have a large family to feed, ask a few friends or colleagues if they would be interested in sharing the bulk purchase. For even better deals, ask the seller if discounts are available for those making bulk purchases. However, if you’re buying from a larger supply chain, then discussing discount rates may sometimes be a problem. Though both whole and ground chia seeds are available for consumption, from a health point of view it would be more prudent to get whole seeds. Certain nutrients like omega-3 lipids and vitamins are more secured in whole seeds, thereby increasing their overall shelf-life. Nevertheless, if you like using ground chia seeds instead of their whole counterparts, it would be best to grind them on your own before adding to any recipes. The trick is filling a can then emptying a hand-held pepper mill with a few whole chia seeds. Thereafter, twist the mill to crush all of the seeds, the same way it’s done when grinding pepper. Online retailers typically sell chia seeds in packets of different sizes in order to cater to the varying demands of online shoppers. We are big fans of the Navitas Naturals Organic Chia Seeds which come in 16-ounce pouches. For maximum quality, always look for natural seeds that have not been cross-contaminated with chemicals during the production stage. Named after the Mayan word for "strength," the tiny chia seed is a substantial source of protein, fiber, vitamins, minerals, and antioxidants! Chia Seeds are abundant in omega-3 fatty acids. Omega-3's are are revered for their anti-inflammatory properties and essential for optimal functioning. 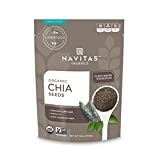 If you prefer the convenience of virtual shopping and reside in the United States, then there are various chia seed brands that can be bought from Amazon. They come in various sizes, grades and colors for customers to choose from. Chia can either be taken whole or used to make certain favorite desserts. Chia pudding is very popular in the U.S. and is made using three ingredients which are seeds, almond milk and some maple syrup for sweetening. Though there are different types of chia that can be used to make pudding, most people prefer the white seeds to the black ones which are not very good at absorbing almond milk. Another great brand is Viva Labs Organic Chia Seeds which come in a 2 pound bag. The quality of white chia seeds is great, plus their price also gives them amazing value. Moreover, they can be added to oatmeal for breakfast or even smoothies to increase taste. Amazon delivers chia seed products quickly and well packaged. However, some of their items can only be shipped within America and to FPO/APO addresses. But for APO shipments you’ll have to check with the product manufacturer on matters regarding warranty and support. There are various grocery stores across the United States that sell quality chia seeds, such as Wegmans, Ralphs, Loblaws, Kroger, and Target among others. While at the grocery store, look for chia seeds sold in the bulk section, natural foods area or aisle where packaged goods such as rice, beans, and other whole grain products are sold. Additionally, a few grocery stores have chia seeds in the supplements section together with nutrient and vitamin drinks. These seeds are typically white or black in color. If you find them in the bulk food area, just scoop some and place inside a plastic bag or container for checkout. In other sections of the store, search for the product in plastic bags, particularly those with re-sealable tops. Apart from puddings and smoothies, you can also spread them on top of cereals or salads. Make sure to check out our recipe for a tasty smoothie that is dairy-free, gluten-free, and non-GMO! Since chia seeds are unprocessed, whole grain foods, they can be digested by the body much easier than flaxseeds. Moreover, their mild, nutty flavor makes them simple to add to beverages and foods. The seeds are more often sprinkled on top of cereal, vegetables, sauces, yogurt, rice dishes or blended into drinks or baked goods. They can also be mixed with water or milk to create a paste. Usually, chia seeds are marketed in 2 ways, either as food or a dietary supplement. Nevertheless, the key to getting affordable seeds is avoiding them when they are sold as dietary supplements. They are much fresher and cheaper when bought in the whole form. In natural food stores, chia is packed in small bags where customers can buy them in measured quantities. Though sometimes they may be more costly here than when bought from wholesale retailers or online. When buying chia, always remember to check the manufacturing date to ensure that the product is fresh. Generally, chia seeds tend to have a longer shelf life than other types of edible seeds. If this post on where to buy chia seeds was helpful, please let us know below in the comments.